There are various Church Clubs detailed on the St. Bridget's Church page. All Saints' Church is a sister church to St. Bridget's, St. Brides Major. 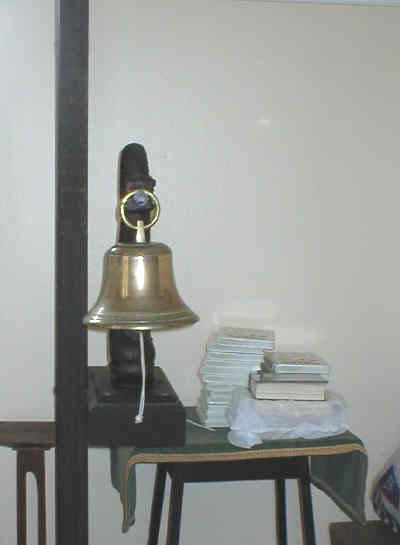 The bell (1) hanging in the vestibule was given by Mr. Peter (G. R.) Heard's family as a gift to All Saints Church in 1987. The montage of pictures (2) on the vestibule wall was made and given by members of the Youth Club. A pew (3) is dedicated to the memory of the men of the Parish who gave their lives for King and Country. The pulpit (3) was dedicated to the memory of Lay Reader Joseph Thomas in 1953. Four chairs (4) are dedicated to four members of the Lindsey and Corkery families killed in action, three of whom who lost their lives in the Great War and one who lost his life in the Second World War. Jenna Lindsey bought an organ in memory of her nephew, Dennis Corkery. A rail (5) normally in front of the smaller lectern was dedicated to Ann Mary Williams in 1946 by her husband (known as Little Dai). Pat Bellamy, Frieda Tom, Joan Kinsbrook and Lorna Pope bought a bookcase (6). This was dedicated to Pat Bellamy in 1995. The Psalm plaque (7) was given in memory of Evan Williams in 1938. Following the closure of Horeb Chapel (more information on St. Brides Major History page), a pulpit chair (8) as well as a chair (6) given in memory of Mr. Desmond Lintern by his wife Iris were donated to All Saints Church. A green drape for the lectern was donated by Frieda Tom in memory of her husband. An ironwork flower stand was given by Joan Kinsbrook in memory of her husband Martin. Carpenter Jim Powell who was head of workmen on the Dunraven Estate made the altar in memory of his wife, Katie who was caretaker of the "old" market hall in Bridgend, also owned by Dunraven. A funeral service was held in All Saints Church for the first time on Friday, 24th May, 2012. 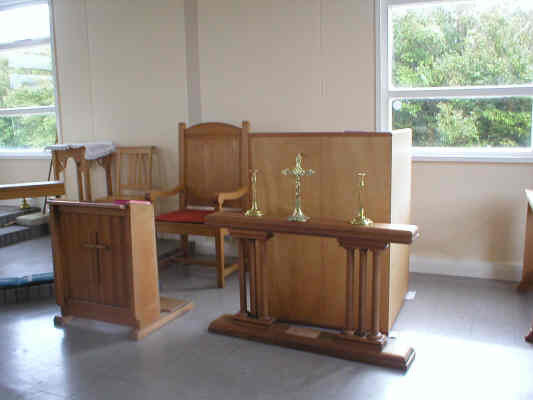 The previous place of worship on the site was originally a Reading Room that became the Mission Room; there are some details and a photograph on our Southerndown History page but for more information have a look at the Ewenny and St. Brides Major Parish website. All Saints Church was built in 1968.